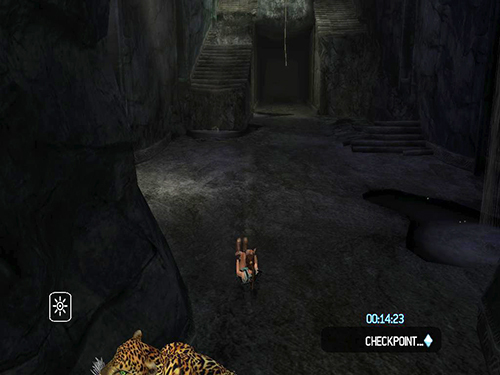 At the beginning of the level, roll or "Swan Dive Jump" down the path until you trigger the cutscene. 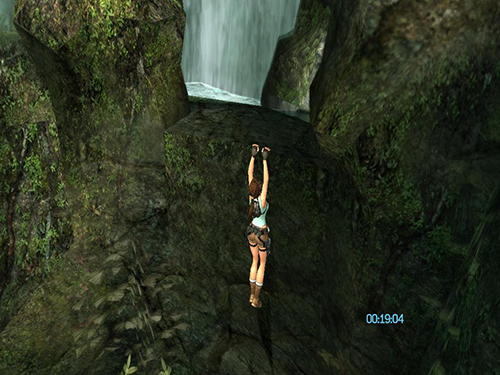 There is no time to play in the water, get out and quickly use the dangling rope and grapple to open the drawbridge and trigger the "grand entrance" cinematic. 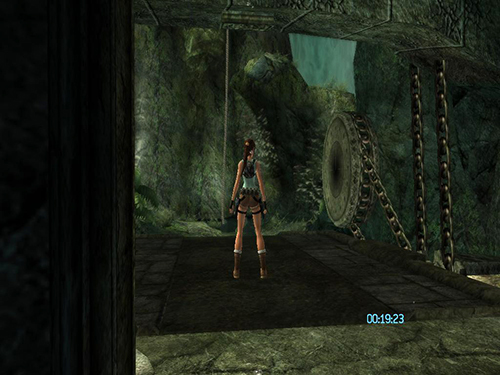 Now it is time for a big shortcut through this level. This will not be easy. I suggest practicing before starting the Time Trial. 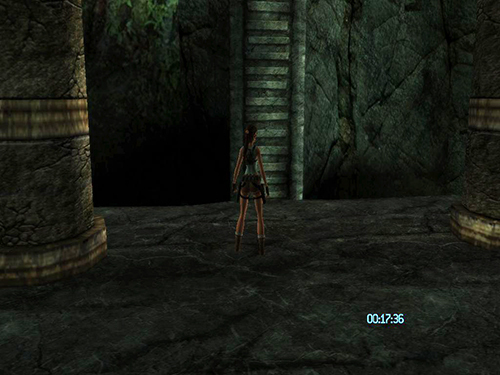 You probably won't be able to do it on the first try, but once you master the shortcut, it will help you finish more than 70% of level under 2-3 minutes. After the drawbridge is opened, grab the rope again. 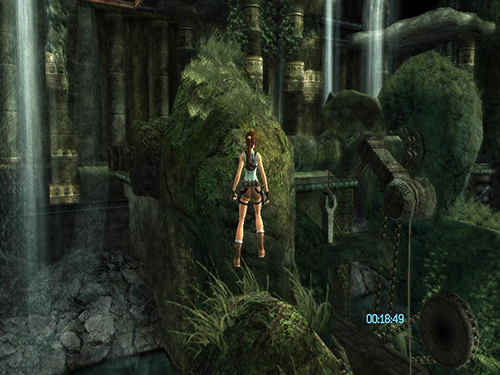 Face Lara to the left side of the bridge and swing two/three times facing the cliff, as you can see in this picture. 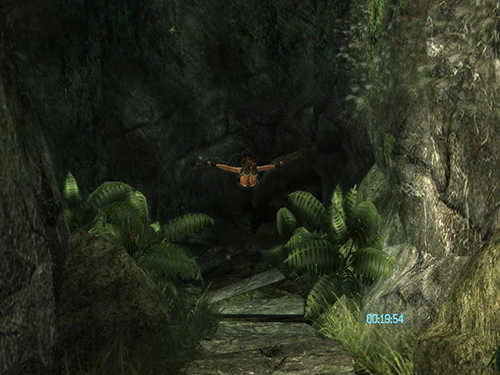 Swing and jump forward, and magically Lara will land on an invisible platform. From here jump again and she will grab this flat ledge. 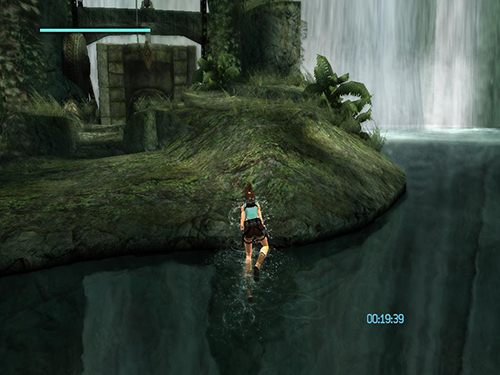 After this, turn left and jump onto the rounded rock beside the flat ledge. 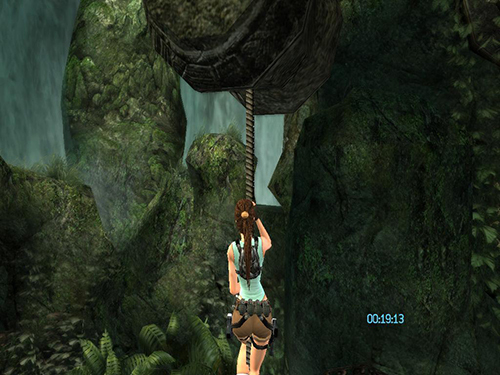 Once Lara is on top of the rounded rock, turn around to face the taller rock formation. 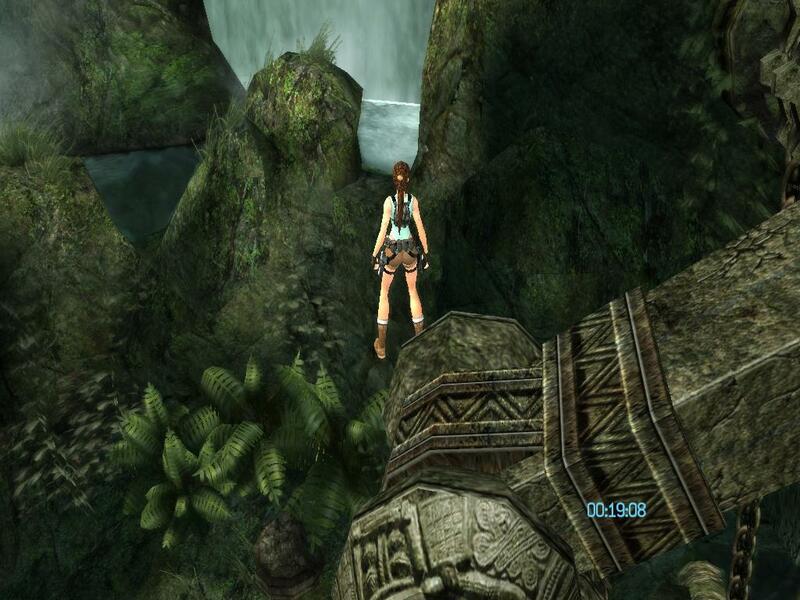 Very carefully inch forward and to the right until Lara is standing on the tallest part of the rounded rock. 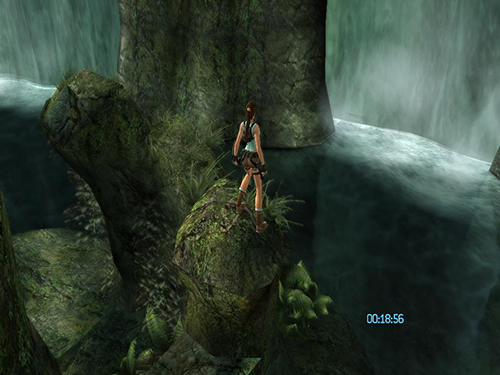 This is actually an invisible protrusion above the rock. 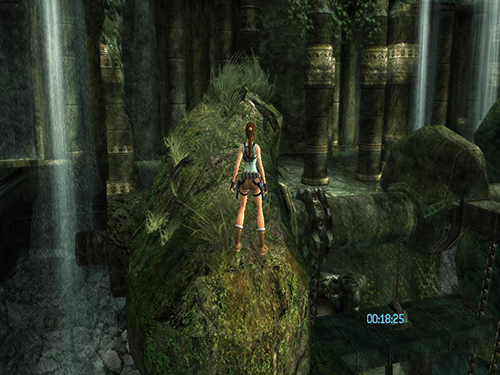 Jump from the top of this rock to the front left corner of the ledge in front of the ruins. Then go around behind the tall columns to the right. 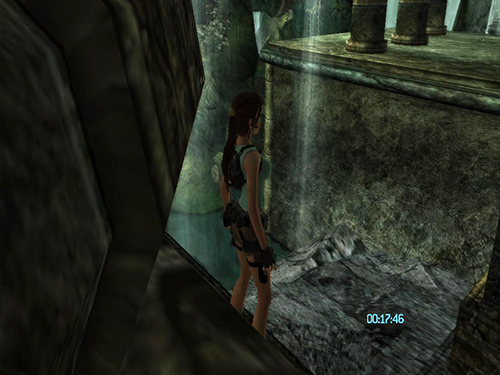 Once you are on the balcony of this ruin, you can jump down into the dark gray area where the water is flowing down and from there jump to the upper ledge. 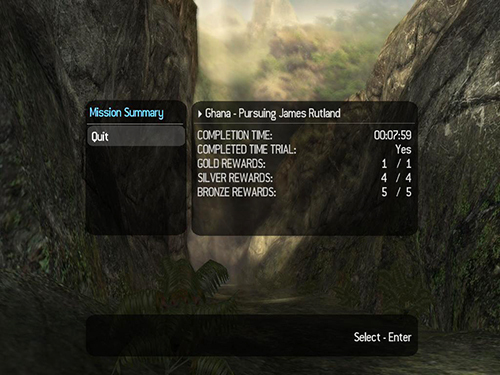 Again I suggest trying the shortcut a few times before playing the Time Trial. It is not easy at all and it will take some practice, but it's much better than playing the whole level. If you make a mistake with the shortcut, you are still very close to the start, so you easily can try again. Since you have saved so much time by using the shortcut, there is no need to panic here. Just use your own skills to get through this area. Even if you die, you will have a lot of time to finish. 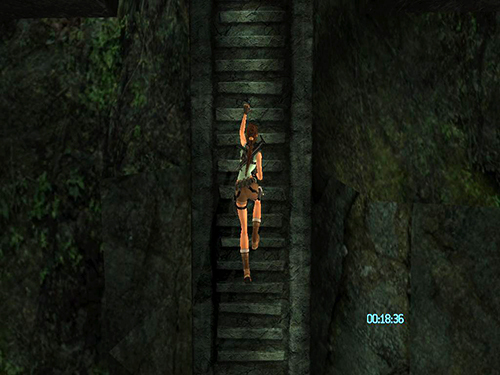 Swan dive down the stairs and Lara will reach the bottom in 2 seconds. 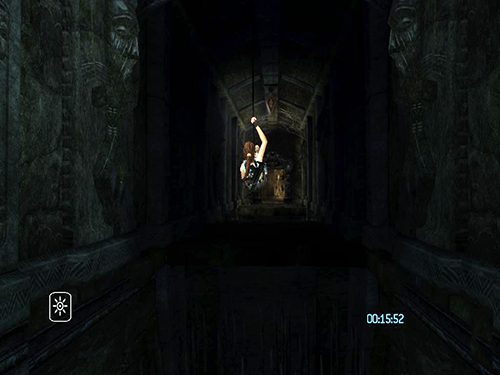 When you swing across the pit, try to jump on the first swing. The hole is not so big, and you should be able to make it across. 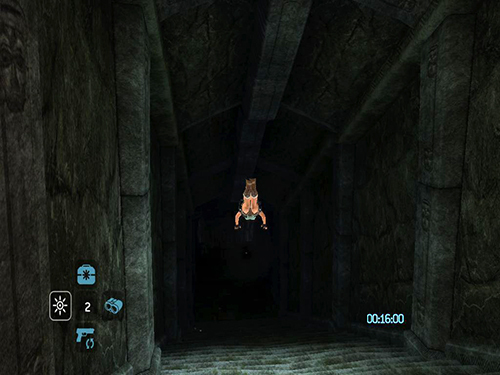 Roll or "Swan Dive Jump" along the rest of the hall to cover the ground quickly. 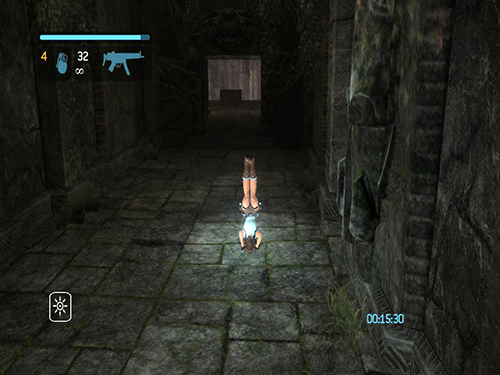 When shooting enemies the best strategy is to shoot while running towards them. 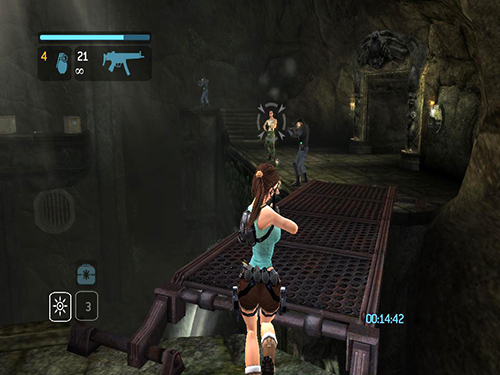 If you played the levels in order, you should have cheats for two weapons and there is no need to worry about ammo. 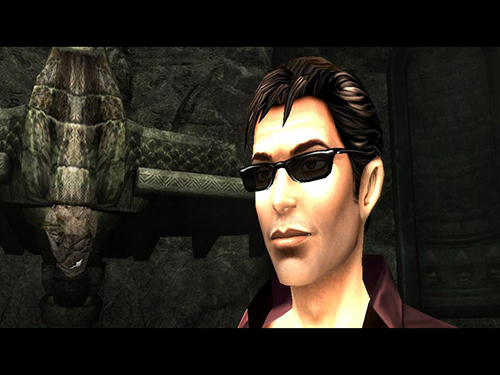 You can ignore the jaguar, just reach the stairs and he won't be able to follow you. Now to fight Rutland. If you used the shortcut at the beginning and have unlocked some cheat codes, you should have a lot of time and unlimited ammo. 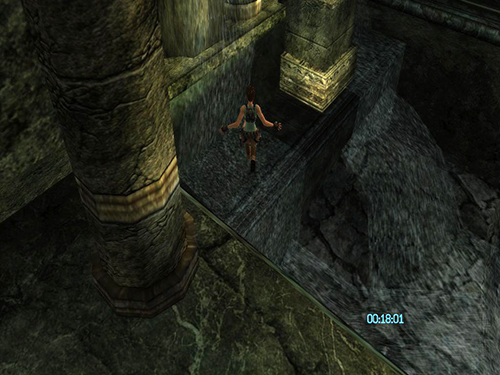 In the trapped hallways with the slicing blades and rolling boulder, instead of using the blocks to stop the slicing blades, do some well-timed jumps: Wait until the two sets of blades move apart, and then duck under the high one and jump over the low one. With careful timing, you can get through with little or no damage.